Heat oil and add cloves, cinnamon, cumin seeds, red chillies, cardamom and bay leaves. Mix well for a minute and then add the remaining ingredients and fry for another two minutes. Finally add about 3 1/2 cups of water and pressure cook it. Temper with little ghee and mustard seeds. 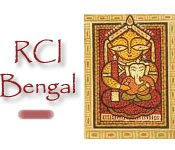 This dal goes to Sandeepa for the RCI : Bengal event. dal looks good...addition of spices must have enhanced the flavour.. Thanks all of you for your comments..
@ Namratha..no dear, I wanted the dal to be a little watery, maybe thats why the dal sunk to the bottom of the bowl.